Coffee @ home is a charming guest house and coffee shop situated in the small town of Prieska, about 240 km south of Kimberley. The guest house offers three en-suite rooms named after different coffee types, all with private entrances. The rooms are equipped with air-conditioning, tea and coffee facilities, Internet connection, hair dryers and TV's with DStv access. 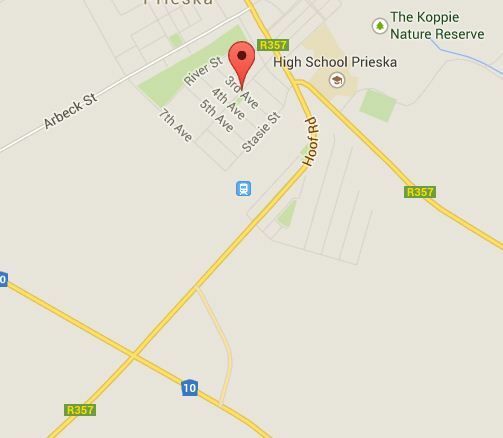 Prieska is a town located on the south bank of the Orange River, in the Northern Cape. This is the ideal place to escape the busy city life, and to just relax in a quiet environment. These rooms has a queen-size bed and en-suite bathroom (shower only). As well as M-Net, DStv, Air-Conditioning, Television, Tea and Coffee Facilities, Internet Connection, No Smoking in Rooms, Hair Dryer, Garden view. This room has a double bed with en-suite bathroom (shower only), M-Net, DStv, Air-Conditioning, Television, Tea and Coffee Facilities, Internet Connection, No Smoking in Rooms, Hair Dryer, Garden view.